The book contains different thoughts about different life situations. So you don’t have to read it in any sequence. This may also be helpful for the people who just cannot read a lot of stuff. Simply open up the book at any page and take the message. You can note the affirmation if it appeals to you & can use it for as long as you want. You can also make your own affirmation and work on that. The idea of the book is to present a healthy perspective to many life scenarios. If you like the thought presented, let it sink in. We can bring about significant change in our lives working on one thought a day or a couple of days. So enjoy the journey! Dimple (Sukhwinder Kaur Walia) is an Electronics & Telecommunications Engineer, Reiki master, an avid reader, practitioner of Angel therapy, Silva mind control, Ho’oponopono technique and follower of Louise Hay philosophy. She runs a facebook group named ‘Foundations for Life- Personal Development + Spirituality’. She believes in being open to different paths & imbibe the best from everywhere. Dimple advocates following your own intuition or gut feeling ultimately & trusting your own inner voice. She has written articles for some magazines. She conducts workshops around her fields of interest. Currently she is working on two more books and a workshop comprising of all the tools she has found effective in her personal journey. How the author produced this book? I, would like to express my gratitude to God, my family, friends and all the people in my life who have inspired me to reach here. In fact I did not intend to write a book at all. Two years back (in Sept 2011) I made it a practice to learn & share (with my friends) at least one lesson per day and as the time went by, I had got collection of 200+ thoughts. On the suggestion of some dear friends I decided to compile these thoughts in the form of a little book. Since last few years I have been into spiritual practices like Reiki (Reiki Master), Angel therapy, Heal your life (Louise Hay), Ho’oponopono technique, Silva Mind Control method and a few more which have influenced my thoughts. I also had the opportunity to conduct few workshops on some of these subjects. I believe that life is our greatest teacher and we can continuously learn from each & every interaction, encounter and situation. It only needs one to be aware & willing to learn. The intention behind writing this book is to provide a consolidated collection of my learning till now that can be used to transform ourselves on an ongoing basis. 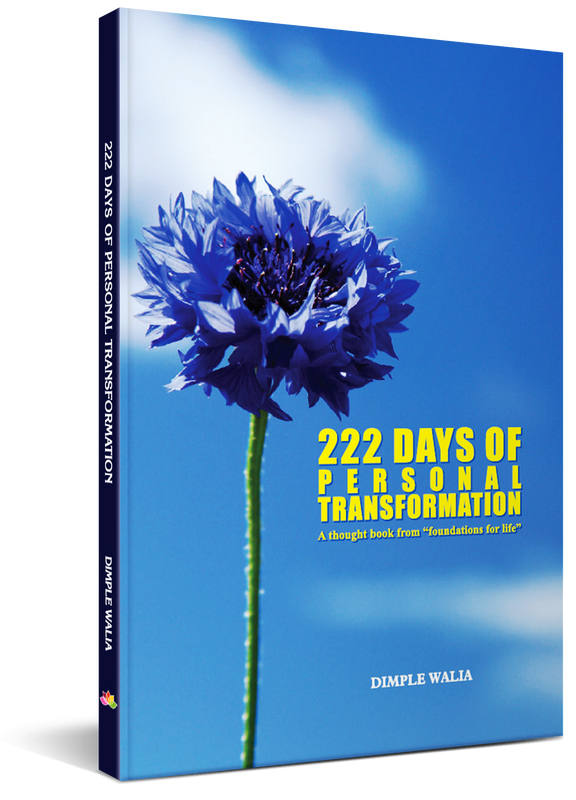 The name of the book as “222 days of personal transformation” is given keeping in mind that 222 is one of the Angel numbers that signifies to have faith & continue doing the good work & it brings assurance from the angels that everything is going to be all right. Readers may read only one thought per day. Limited content if repeated the whole day will stay in our subconscious mind and help transform our lives. My best wishes to all the readers, God bless all.